In episode 10, she wore Fringed Wool-Blend Shorts from 3.1 Phillip Lim Fall/Winter 2010 collection. The outfit was styled with a white top. 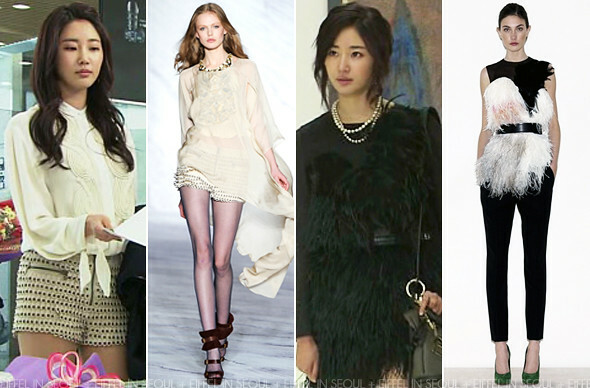 If you remembered, Han Chae Young (해결사) also wore the shorts back in September. In episode 12, she opted for a modified feathered dress from Céline Pre Fall 2010. Pearl necklace and a shoulder bag to complete the outfit. In episode 11, Kim Sarang (김사랑) keeps herself warm in Alberta Ferretti Fall/Winter 2010 black coat. The outfit is styled with black tights, pumps and a shoulder bag with silver accessories. In episode 13, she wore Isabel Marant Fall/Winter 2010 dress as a top. Styling it with a pair of grey jeans and patent black boots which I am not a fan of. In episode 14, Kim Sarang (김사랑) wore an outerwear from Moschino Fall/Winter 2010. The outerwear features gold keys as embellishments, very interesting. Her outfit was styled with a ruffle top and grey jeans. One of the best looks I've seen on her so far. Which is your favorite look so far?